L’art évoque le mystère sans quoi le monde n’existerait pas | One quality, the finest. 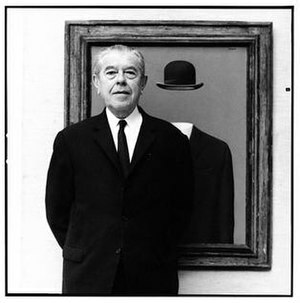 Belgian surrealist painter René François-Ghislain Magritte was born on November 21, 1898. He started painting when he was only 12. One of the most formative events of his life happened when he was only 14. His mother committed suicide by throwing herself from a bridge and young René saw her corpse in all its horror when the body was recovered a few days later. He spent the years of World War I at the Academy of Fine Arts in Brussels where he became influenced by surrealist Giorgio Di Chirico. He embraced Di Chirico’s idea that every painting should be “a visual poem.” Magritte’s classical training made his work harder for the critics to dismiss, for clearly he could paint with astonishing realism. Magritte played with logical, rather than physical, realities. He wanted the viewer to say “why?” and ponder the reasons disparate objects were placed together or in settings where they made no “sense.” He also painted caustic parodies of famous paintings, endearing himself to those with a sense of humor, but not to the serious art world. Magritte died on August 15, 1967 at the age of only 69, leaving behind a body of work of about 1,000 paintings that are sought after by all the best contemporary art museums as well as discerning collectors. 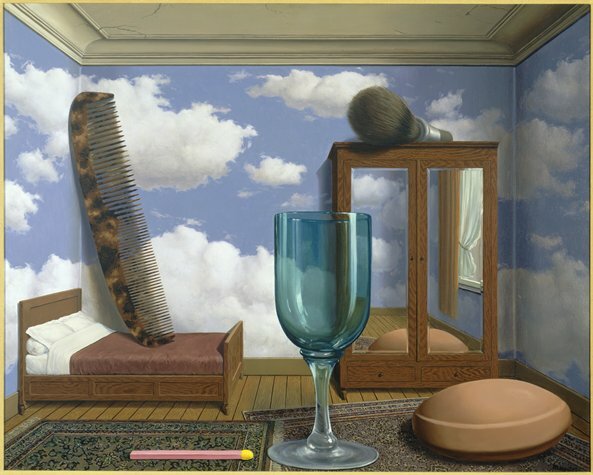 You can visit the Musée Magritte in Brussels, which is housed where he lived for many years. 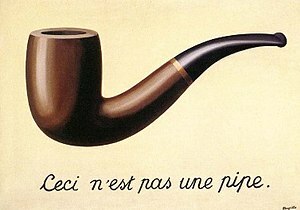 Today’s phrase is a Magritte quotation: “L’art évoque le mystère sans quoi le monde n’existerait pas,” (lar ayvok luh misstare sahn kwah luh mohnd nex-is-te-ray pah), which means “Art evokes the mystery without which the world would not exist.” With all this in mind, what do you think his mysterious painting at the top means? Your guess is as good as mine and he’d be OK with that. This entry was posted in Art, People and tagged L'art évoque le mystère sans quoi le monde n'existerait pas, Les Valeurs personnelles, Magritte, Musée Magritte Brussels, René François-Ghislain Magritte, René Magritte, surrealism, surrealist. Bookmark the permalink. Pingback: Très solitaire dans mon travail, j’en suis, en fait, presque jaloux | One quality, the finest. Pingback: Parler de la pluie et du beau temps | One quality, the finest.